NEW YORK--(BUSINESS WIRE)--Libra, the premier provider of accounting, audit, and tax software for the blockchain and cryptocurrency industry, today announced the launch of Libra Crypto Office, an enterprise application that automates and optimizes back and middle office processes and reporting for funds, market makers, and exchanges. Libra also announced two premier customers, leading trader and liquidity provider XBTO and ShapeShift, a blockchain asset exchange platform. Libra Crypto Office offers the industry its first institutional-grade solution with a product that’s purpose-built for the technical nature of blockchains and cryptocurrencies while also meeting institutional investor, fund administrator, and regulatory requirements. The product provides customers the information accuracy and transparency required to grow quickly while managing compliance needs. Libra Crypto Office adds value through a three-stage process. First, it offers a single on-ramp that connects to exchange platforms, blockchains, and other data sources within the ecosystem. Second, the solution continuously normalizes and enriches millions of transaction records through real-time data processing engines. 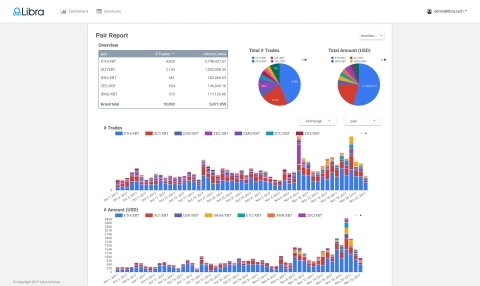 Finally, it assembles actionable insights and reports such as trading, inventory, and tax information which can also be delivered to other enterprise systems via APIs. The launch follows Libra’s recent announcement of its $7.8 million Series A round led by a prominent, multi-billion dollar European family office. Participating investors included Liberty City Ventures, XBTO, Boost VC, and Lee Linden. Libra will be demonstrating Libra Crypto Office during Consensus: Invest at Booth #22. For more information, please visit the conference’s website here. Please contact +1 (612) 930-1840 or sales@libra.tech. Founded in 2014, Libra, a pioneer in financial software for the blockchain and cryptocurrency industry, builds premier solutions that automate and optimize accounting, audit, and tax processes. Libra’s solutions are purpose-built for the world’s most demanding customers who require highly scalable and secure reporting, compliance, and control solutions. Libra is based in New York City. For more information, visit www.libra.tech. ShapeShift is a crucial piece of infrastructure in the world of cryptocurrencies. From start to finish, users can exchange blockchain tokens in seconds, with no account required. No emails or passwords. No lengthy signup process. No accounts. No bid and ask orders. No friction. ShapeShift’s goal is to be the fastest, safest, and most convenient way to swap digital assets. For more information, visit www.shapeshift.io. Founded in 2015, XBTO has rapidly evolved into a leading and diversified participant in cryptocurrency markets. Our experienced team of financial and technology professionals develops trading software and conducts proprietary trading. We act as a liquidity provider on leading electronic platforms and OTC. XBTO is also an investor to many leading companies and advises accredited investors on crypto-related strategies. For more information, visit www.xbto.com. This release does not constitute an offer to sell or a solicitation to buy any securities in any fund or product and may not be relied upon in connection with any offer or sale of securities. Such offer or solicitation may only be made pursuant to a current confidential private offering memorandum that will be provided only to qualified offerees.